Oh yes, my friends, it’s that time again! If you missed June’s 30for30crafting, then let me give you the rundown: You commit to do something creative for 30 minutes for 30 days. The umbrella is broad — anything creative from physical crafts to writing to digital media is perfectly awesome. The point of this is to get those creativity juices flowing. The process is simple. 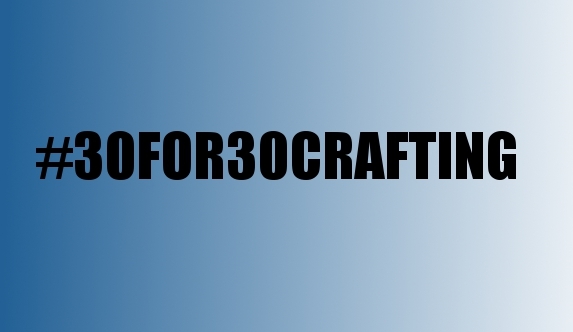 Starting on August 1, post your picture on Twitter, Instagram, or Tumblr and tag it with #30for30crafting . Then, keep your eyes peeled for that tag and encourage the creative souls who are doing this with you. And since August has 31 days, you even have a day to take a break. I answered a bunch of questions over on this post here, so check ’em out. If you still have any questions, drop me a line here and I’ll answer it for you. I’ve already got a Pinterest board for all of the people who posted pics on IG and Twitter in June. And have one set up and ready to go for August. So, get the word out — tweet, tumblr, IG, blog, FB the information out. It is awesome to see how much you can do in just one month! And if you have any other questions, don’t hesitate to give me a shout. Pingback: August Challenges | Hugs are Fun!